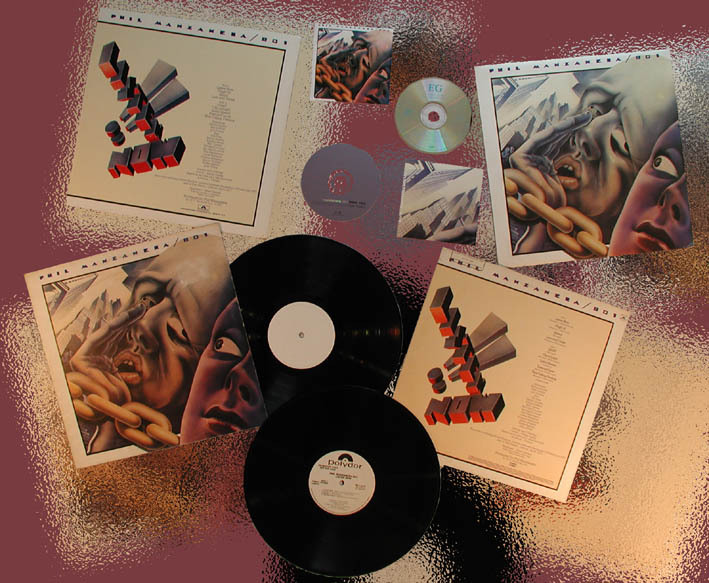 After the succes of Phil Manzanera's Diamond Head album and the 801 live shows, Phil put together most of the musicians from these projects along with additional help from 10CC's Godley & Creme and Tim Finn from Split Enz (and the eventually Crowded House) to work on this concept album over a period of 18 months. The album did not acheive much commercial success despite much critical acclaim in the music press. Flight 19 was released as a single in UK with Car Rhumba as it's b-side. Car Rhumba B-side to Flight 19. Rude Awakening Left over form the Listen Now sessions. Blue Gray Uniform Left over form the Listen Now sessions. Phil Manzanera Guitars On "Listen Now", Guitars On "Flight 19", Guitars On "Island", Guitars, Hammond Organ On "Law And Order", Guitars On "?Que? ", Guitars, Acoustic Piano On "City Of Light", Guitars On "Initial Speed", Guitars On "Postcard Love", Guitars On "That Falling Feeling", Guitars On "Rude Awakening", Guitar On "Blue Gray Uniform", Guitar On "Remote Control Demo"
Simon Ainley Lead Vocals On "Listen Now", Lead Vocals On "Flight 19", Lead Vocals On "Law And Order", Lead Vocals On "City Of Light", Lead Vocals On "Postcard Love", Lead Vocals On "That Falling Feeling", Lead Vocals On "Blue Gray Uniform", Lead Vocals On "Remote Control Demo"
Bill MacCormick Bass, Vocals, Wurlitzer Bass On "Listen Now", Bass On "Rude Awakening", Bass, Lead Vocals On "Flight 19", Bass On "Island", Bass, Vocals On "Law And Order", Bass On "?Que? ", Bass, Lead Vocals On "City Of Light", Bass On "Initial Speed", Bass, Lead Vocals On "Postcard Love", Bass, Chorus Vocals On "That Falling Feeling", Bass, Backing Vocals On "Blue Gray Uniform", Bass, Backing Vocals On "Remote Control Demo"
Dave Mattacks Drums On "Listen Now", Drums On "Rude Awakening", Drums On "Law And Order", Drums On "City Of Light"
Mel Collins Saxes And Big Band On "Listen Now", Soprano Sax On "Initial Speed"
Bill Livsey Wurlitzer Piano On "Listen Now", Fender Rhodes, Clarinet On "Law And Order"
Simon Phillips Percussion On "Listen Now", Drums And Percussion On "Flight 19", Drums On "Island", Drums On "?Que? ", Drums On "Initial Speed", Drums On "Postcard Love", Drums On "That Falling Feeling"
Paul Thompson Drums On "Blue Gray Uniform", Paul Thompson Drums On "Remote Control Demo"
David Skinner Keyboards On "Blue Gray Uniform", Keyboards On "Remote Control Demo"
Ian MacCormack Vocals On "Listen Now", Harmonica On "City Of Light"
Kevin Godley Vocals, Pecussion On "Listen Now", Chorus Vocals On "Flight 19", Heavenly Vocals On "Initial Speed", Heavenly Voices On "That Falling Feeling"
Eddie Jobson Acoustic Piano On "Flight 19", Acoustic Piano On "Postcard Love"
Eno Guitar Treatment On "Flight 19", Synthesizer On "Island", Chorus Piano On "City Of Light", Synthesizer On "Postcard Love", Synthesizer On "That Falling Feeling"
Tim Finn Backing Vocals On "Flight 19", Chorus Vocals On "That Falling Feeling"
Lol Creme Chorus Vocals, Gizmo On "Flight 19", Gizmo On "Initial Speed"
Alan Lee Chorus Vocals On "Law And Order"
John White Tuba On "Law And Order"
Rhett Davies Frog On "City Of Light"